Every year, Macy’s Union Square in San Francisco gets a visit from Santa and his little animals. These particular animals are homeless cats and dogs from the San Francisco SPCA. The window themes this year are the best I’ve seen. Each little fur ball is set in what appears to be the outside courtyard of a home. 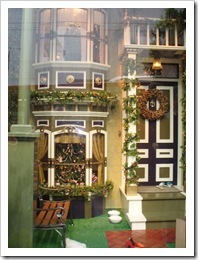 A miniature Victorian with ivy garland twirled around the balustrade and down the columns provides a cozy scene as you look into the house windows to find a decorated holiday tree. Another window is fitted with a more modern home façade with a mock waterfall in the front. There is also a log cabin style complete with rain boots out front as if someone has just come in from fishing. Of course, the animals don’t care that they are in cute confines. They just want water, food, a warm place to sleep, and your love. Adoption fees for these critters go to support the San Francisco SPCA. Last year they raised a reported $37,000 and found homes for 277 pets. According to the SPCA website at www.sfspca.org, each animal comes with a 30 day gift of pet health insurance, a free dog or cat advice DVD, a leash and collar (for dogs) and discounts on most SF/SPCA training classes. Adopters also receive a gift bag filled with samples, treats and valuable certificates from sponsor partners of The SF/SPCA and Macy’s. 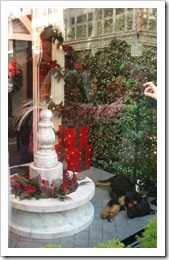 Animals are on display from store opening to one hour before they close from now until January 1st. Older PostWhich Sweet Pickles character are you?